Address: 20 West 29th St.
A clever mix of high and low brow sets this cool Seattle brand apart from the pack. Rather than numerous chandeliers and dudes in penguin suits, you’ll find the Ace’s lobby packed with hot, modelesque women and creative types huddled over Macs. Those who haven’t opted to set up shop at the long, lamp-clad tables are generally parked in front of the bar or on the suede sofas, giving the space the feel of a sceney study hall. But don’t get it wrong, this hip hotel is also surprisingly warm. Cool, informal touches like turntables and vintage furniture give its affordable rooms (starting around $250) a homey feel. Or if you’re feeling something more spacious, the Ace’s loft ought to do the trick. 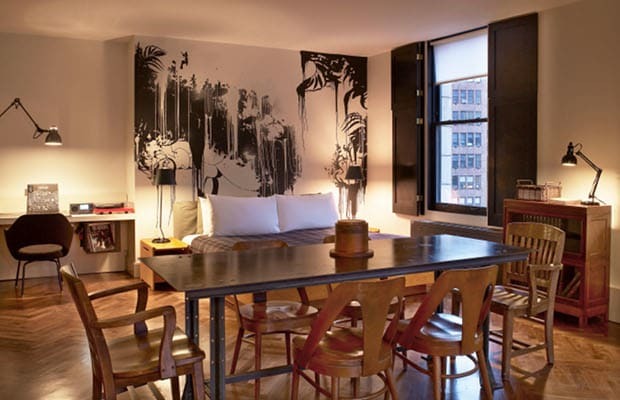 With stylish bay windows looking out onto Broadway, a vinyl collection, and even its own usable guitar, a stay in the hotel’s dapper 700 square foot rental ($750 and up) is kinda reminiscent of crashing at your trust fund friend’s apartment—minus the prescription drug binges.